We are switching things up a bit here, lovely readers. For all of you brides out there, this week we have a different type of vendor. 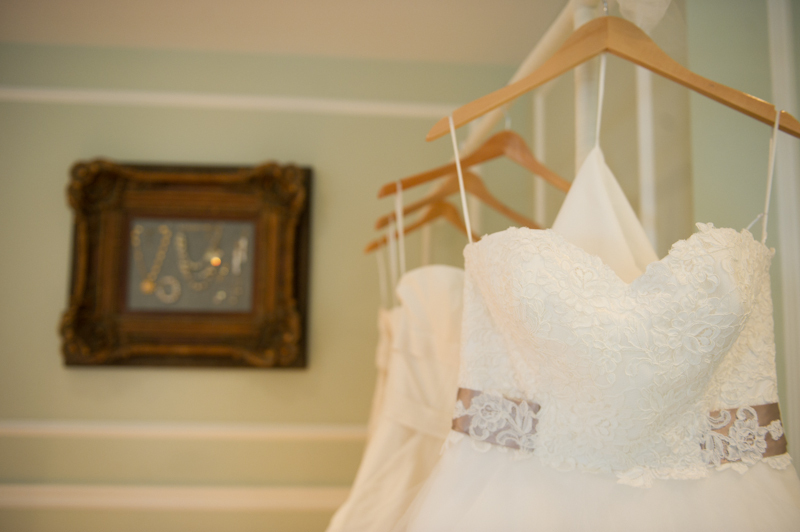 We're showcasing Beth Chapman, owner of The White Dress by the Shore, a bridal boutique in Clinton, which offers WAY more than just a day of shopping, lace and frill. Read below to learn about Beth's mission; how she got into fashion [and more specifically, bridal fashion]; and what White Dress is all about! [GG]: How did you get into the wedding dress business? Did you always know you wanted to be involved in the fashion industry? [Beth]: My history with fashion goes WAY back to my high school days. I have always worked in retail. I was hired by Ann Taylor’s corporate office in Manhattan out of college. I worked my way up in the company and by the time that I left, I was the Vice President of Merchandising for their Dresses, Suits, Career Separates and Special Occasion Division. I have always loved fashion and have always had a special place in my heart for bridal. I do feel that I was destined to be a bridal boutique owner! [GG]: How do you, at The White Dress by the Shore, create an experience (rather than just a day of shopping) for the bride? [Beth]: At The White Dress by the shore, it is ALL about the experience. 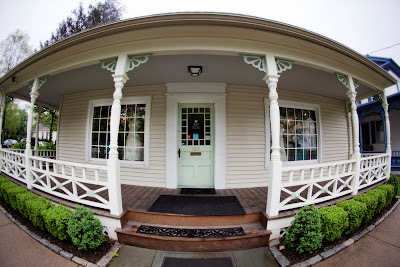 I situated my boutique in an antique house because I wanted my brides to feel at home here. The exposed beams, hardwood floors and stone fireplaces, all add to the enchanting ambiance. We are by appointment so that each bride and her guests have our undivided attention. 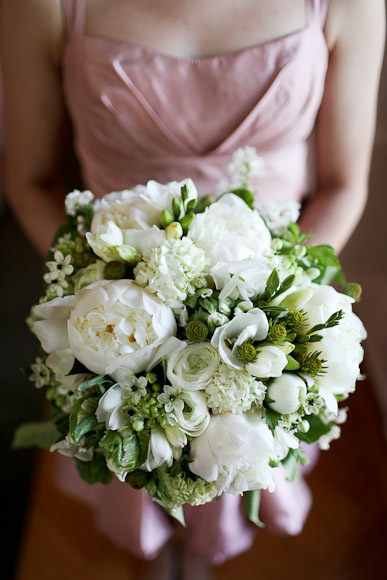 Our brides have dedicated stylists who work with them to create the perfect look to match their vision. Our guests are served beverages and are seated in quaint, private seating areas – all to ensure an intimate experience. [GG]: What differentiates your store from other bridal boutiques? [Beth]: We take pride in the appearance of our store and the level of service that we provide our clients. We go above and beyond in every interaction with the bride- whether it is in person or on the phone- to ensure that they are receiving the highest level of service. We offer unique services, like a dressing service on the day of the wedding and White Carpet Appointments- where a bride and her guests are the only ones in the store and are treated to a photographer, catered treats and a bridal bouquet in the colors of their wedding- that help to differentiate us from our competitors. Every single one of my employees- from my sales associates to my seamstresses- love what they do and love working with brides! I think that passion is reflected in how we treat our clients. [GG]: What are some characteristics that help you determine a bride's style? [Beth]: A stylist visits with the bride at the beginning of her appointment and inquires about the level of the formality of the wedding, the time of day and location of the reception so that we can be sure that the gown matches where and when she is getting married. We ask the bride about her vision for her day- what styles she has admired and the physical traits that she want to highlight. We also appreciate that our brides trust us to select styles that they might not have initially been attracted to on the hanger. Our trained stylist often immediately can identify the perfect dress for their client just by their initial conversation and getting to understand the personal style of the bride. [GG]: Can you tell us your top five style tips for brides and their wedding parties? Select attire that reflects your own personal style. Your wedding day is not the time to make an over-the-top fashion statement! Be sure to select the correct undergarments. The foundations that you select directly affect the fit of your dress. Side note: be sure to visit beneath the gown, a foundation boutique located within our store! Be sure to accessorize your gown/bridesmaid dress. Great accessories are the icing on the cake! If you are looking to add color to your attire, it does not have to come from the dress itself. It is fun to play with colorful accessories and highlight the accent color of your wedding in your attendants shoe or jewelry! Be sure to select a gown that compliments your body shape. The days of having all of your maids wear the same silhouette (or color for that matter) are gone! If your party incorporates all shapes and sizes, allow your maids to select the dress that best compliments their silhouette. [GG]: How do you actually choose a timeless wedding dress? Is there such a thing? [Beth]: A timeless style is one that is classic and does not reflect the current trends. Generally an aline or ball skirt with classic details or lace are considered timeless. I also think a simple chapel length veil is oh so timeless and elegant! [GG]: Trends that you're happy to see go? [Beth]: I am happy to see pick-up skirts and colored sashes pass us by! [GG]: Trends that you'd love to see return? [Beth]: Sleeves! I love a gown with a sleeve! Sleeves are timeless and elegant. I also adore gloves with gowns. It is such a lady-like look that I would love to make resurgence. I would also love to see guests at weddings wearing hats and fascinators. Wearing a hat to a wedding is so feminine and proper...I would love to see that trend re-emerge! [GG]: A more personal question: What was your wedding dress experience like when you got married? Did this experience help shape the way that you manage your store? [Beth]: While working at Ann Taylor I became engaged and of course wanted to shop right away for my gown! My mother was living in Madison and I wanted to shop with her along the Connecticut shoreline, but there were no boutiques that mirrored my taste level. We shopped quite a bit in New York where I was living and I found my experience lack-luster. I found the gowns to be dirty, the associates to be rude and I of course being a merchandiser wanted to customize all of the gowns that I tried on, and that was frowned upon by the store that I visited. Ultimately, through my connections in the industry, was able to have a gown designed and fit for me by renowned designer Carmela Sutera. 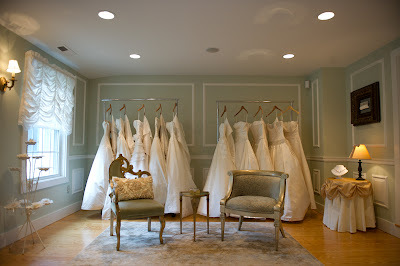 My experience with her was intimate, personal and memorable…everything that I dreamed my gown shopping experience to be. That experience inspired me to create my own bridal boutique that provided brides with everything that I dreamed of when I shopped for a gown…8 years later, here we are! We talked with Josh Behan (and his wife Amanda), as part of our Vendor Spotlight series, this past week. So, we have some entertaining information to share with you, from a very special guy (he holds a special place in our heart after spending the day with us, shooting a 'day in the life' series last Fall). [GG]: Did you always know that you wanted to be a professional photographer? [Josh]: No, I actually had a roommate in Hawaii who was into photography. A friend from work had given me a camera, and Hawaii seemed like as good a place to learn (and live) as any. [Amanda]: Not at all. I was a studio art major in college (URI/University of Hawaii). After we got married, I started working with Josh on the business. [GG]: How did you get into the business? [Josh]: I shot my first wedding when friends (Lauren & Don) hired me to shoot theirs at a house on the beach in Watch Hill. Amanda & I rented the same house for our own wedding a few years later. Once I moved home from Hawaii for good, I started second shooting regularly for a studio in Massachusetts. Luckily, they let their shooters use the photos for our own portfolios, so I started my first website. [GG]: Where do you draw inspiration from? [Josh]: We really enjoy getting to know our couples, and seeing how much they love what we do. It’s a gratifying feeling. I’m (Josh) also inspired by any movie Wes Anderson makes, I think they’re interesting in every way possible. [GG]: What is your favorite spot to shoot in the area? [Josh]: We honestly don’t have one. There are interesting photos to find everywhere. That being said, shooting outdoor events is fun, and we’re lucky to work quite a bit with some local vineyards (Jonathan Edwards and Saltwater Farm). [GG]: What's the most memorable wedding you've worked at and why? [Josh]: For me, it was the wedding of our very good friends Stephanie & Colin in Colorado. Ten of us flew in from RI, rented an RV in Denver, and drove it 4 hours to the wedding. I photographed the wedding while Amanda was in the bridal party. We all spent fourth of July weekend together on the ranch where the wedding took place. Their engagement session in Nicaragua was memorable too. [GG]: What's your favorite moment of a wedding to photograph? Favorite non-wedding thing to photograph? [Amanda]: The moments right before the bride walks down the aisle. [Josh]: I really like shooting any unexpected moments I see. I also think it’s nice to see grandparents holding hands at weddings. As for non-wedding, I love shooting travel and street photography, and our dog when she lets me. [GG]: What is one word you would use to BEST describe yourself? [GG]: What's one of your favorite songs? [Amanda]: Lately, anything by The Tallest Man on Earth, and most of what comes to the Zee Avi Pandora station. [Josh]: I've been really into Neil Young's Live at Massey Hall album, and standup comedy stations on Pandora. We're back with another FABULOUS spotlight. This time, on one of our favorite floral designers. And after reading her answers, we fell more in love! Some of the photos below illustrate weddings at which we've collaborated. Yumiko Fletcher, of Hana Floral Design, is always a pleasure to work with and we would recommend her work to anyone, anywhere. Hope you enjoy her answers...(we sure did)! [GG]: Did you always know that you wanted to be a professional florist? [YF]: Actually, a tragedy caused me to switch gears in life. My mom passed away unexpectedly in early 2001 and it made me re-think of my goals in life. It really was the catalyst for change and got me back into a creative field. I took some time off and a few months later, took a job in a flower shop! [GG]: How long have you been in business and how did your current venture start? [YF]: Hana has been in business since 2004. Prior to that, I had worked for a short time with a partner under a different name, and two years of working at flower shops before that. [GG]: What is your favorite type of couple and venue to work with? [YF]: Well, I really love a bride who loves us! That’s the best. And that bride is usually detail oriented but still somewhat laid back and has a combo of “classic/vintage/modern” taste. They are willing to trust us to create something fabulous for them! 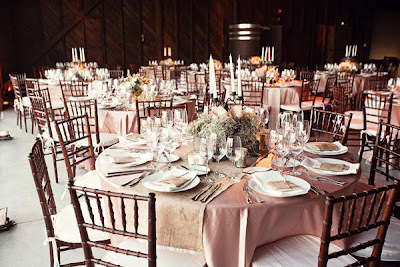 As far as venue~ We love going to new places, we like to travel but we also adore our local venues, like Saltwater Farm, Eolia Mansion, J Edwards, and one of my personal faves is Elihu Island in Stonington. 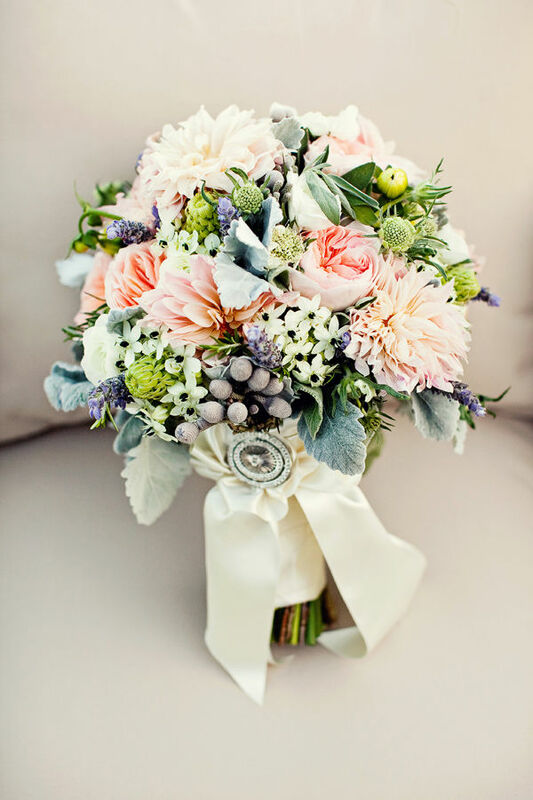 [GG]: What’s your favorite moment of a wedding to design florals for? [YF]: Definitely the bridal bouquet and bouquets in general. Handing my bride her bouquet is the moment for me usually. The reaction says it all and makes my day. 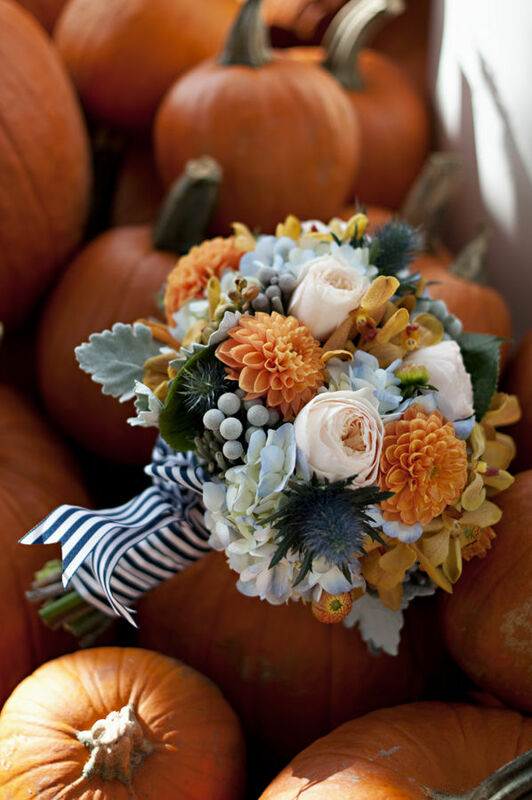 [GG]: Favorite Non-Wedding Floral Occasion/Arrangement? [YF]: Here at Hana, we make gorgeous holiday wreaths! They are hand clamped, which means we mix the greens, not just use a pre-made wreath and decorate it. 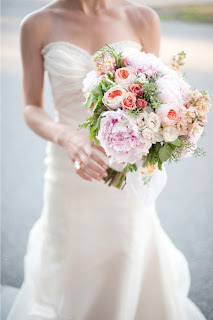 I love the holidays as far as florals go but it’s still second to weddings! [GG]: How would you describe your creative process? [YF]: I usually meet the bride personally and we go through the entire wedding so I can get as many details down as possible. I love to see the dress she picked as well as anything else involved ~ linens, maid’s dresses, any ideas that tell the whole story. Then I draw up a detailed proposal, maybe make a sample centerpiece and then I get going on ordering! We try not to do anything exactly the same even if a bride loves something we’ve already done. [GG]: What are the three flowers that you would say best describes yourself and your style? [YF]: Oh coral charm peony for sure, possibly the phaleonopsis orchid for a little ‘exotic’ and I just love gardenias for their classic beauty and the most amazing scent. Best way for Clients/Vendors to contact you: email really is best. We are a full service catering and event planning company located in Southeastern Connecticut - prime real estate between Boston and New York. Amongst us we have 30 years of custom event experience - from drop dead chic weddings to sophisticated cocktail parties, we've created a party for just about any excuse! We love food, design, and the finer things in life, and are so excited to share a few insider tips with you!